The Vertical Escape Chute is a device which aids in the mass and rapid evacuation of people from high rises in case of emergency. We all agree that life-saving systems are important during life critical and emergency situations. Having measures that ensure maximum lives are saved in case of a disaster is the main objective of life-saving measures. A case in point is of the Grenfell Tower fire, where the ‘stay put policy’ of the high-rise building failed, and massive flames engulfed it. Ideally, there should be a form of emergency evacuation that works fast and efficiently. As much as we look up to fire-fighting methods such as help from the fire brigade, sprinklers and fire extinguishers, at times we have to think of how to preserve human life before getting fires under control. 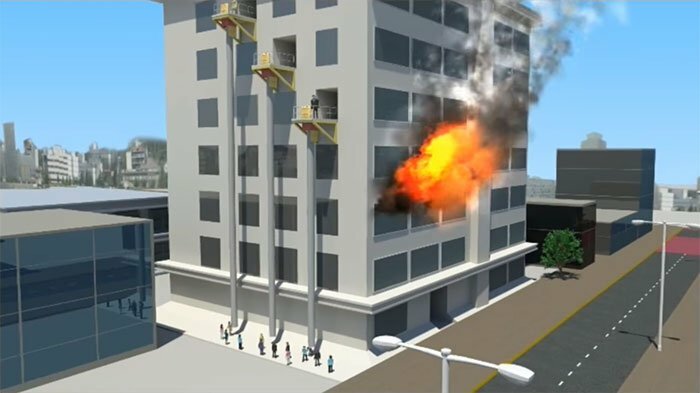 There is a need for efficient and effective evacuation systems that can evacuate many people from high-rise buildings in one go. While ruling out elevators because of obvious electrical issues, an alternative would be the staircase. However, evacuating through the staircase may require a lot of time. The Verti-Scape is a gadget, which helps in the mass and quick evacuation of individuals from high structures. Each chute can evacuate up to 375 people from an elevated structure in a quarter hour. Escape Chute Systems suggest the utilization of standard staircase if possible. However, should the staircase be blocked or filled with smoke, escape chutes are a quick and efficient alternative. The escape chute can be used by people with disabilities. Moreover, the company claims that after a little training, visually impaired individuals are more than equipped to use the chute. It is also possible for a person to enter the chute, and then have an injured second person placed upon their shoulders, to assist the second person to evacuate. The Escape Chute can be installed onto most structures, and just requires a clear drop from the point of evacuation to the ground level. It runs parallel with the side of the structure from which it is deployed, and can be utilized promptly after deployment. As you travel through the escape chute, you can look up and down. No smoke can enter the chute. To exit; your feet will make contact with the ground, you then crouch and extract your body from the chute and leave. The Verti-Scape is manufactured from three completely separate and distinctly different fabric tubes/chutes. Each tube/chute has its own function to perform, and it is only when these three tubes/chutes are assembled together that they then become an Escape Chute. Three separate tubes/chutes combine to form the complete Verti-Scape system. The outer layer of the escape chute (dark grey in pic above) is there to protect the users from flame and radiated heat. It can withstand a constant temperature of between 550 & 600° C, and melts at around 810° C.
The middle/braking layer (light grey) is the layer that makes the system work. 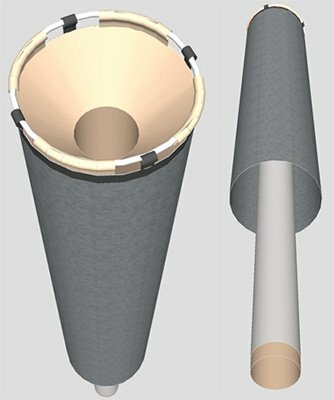 It is an elasticated tube, which is approximately 300mm in diameter in its rested form, but has the capability to expand to 600mm as the evacuee travels through. As the evacuee applies outward pressure from within the chute, the evacuee slow down, and as they release pressure, they speed up. The evacuee has full control of the speed at which they descend. The inner/support chute (beige color in pic) gives the system its strength to hold the weight of all the users within the chute at any one time. This layer has loops stitched into the top, into which a stainless steel rolled pipe is inserted. The pipe is then held in place by the deployment device.